There comes a time every summer when the heat gets us down. And cooking sounds like no fun at all. So what to do? Well, just raid the garden for greens and the pantry for a few staples. Then put together this quick no-cook dish. It’s satisfying but not heavy, with loads of healthy flavor. This salad makes a great one-dish meal or a hearty side. It’s perfect for picnics too. And it takes only minutes to prepare, so you’ll be out of the kitchen in no time—and ready for some summer fun. Pool party, anyone? This dish is quite similar to our White Bean and Tuna Salad and our Summer White Bean and Quinoa Salad. As is the case with those salads, ingredients and quantities for this dish are pretty flexible—so feel free to adjust things to suit your own taste. For example, we used white beans in this salad, but garbanzo beans would make a great substitute. We offer more substitution ideas in the Notes. This recipe makes 2 to 3 main-course servings (or 4 to 6 side servings). It’s easy to double the recipe. Prep time for this salad is 10 minutes or so. You can serve the salad immediately (it’s good at room temperature) or let it chill for an hour or so. Leftovers keep in the refrigerator for 2 or 3 days when stored in an airtight container. (They’re safe to eat after that, but the flavor—particularly the Swiss chard—deteriorates). Rinse the white beans and allow them to drain. Then add the beans to a medium bowl. If you’re using oil-packed tuna, you can either drain it or just pour the contents of the can into the bowl with the beans. If you’re using water-packed tuna, you should definitely drain before adding it to the beans. Wash the Swiss chard and remove the ribs (discard them or save for another purpose). Chop the chard reasonably fine—the easiest way to do this is to roll the chard leaves into cylinders (like cigars) and then cut them into thin slices. Add the chopped chard to the bowl with the beans and tuna (adjust the quantity of chard so it looks “right” to you; you definitely want a lot of Swiss chard in this dish, but you don’t want it to overwhelm the beans and tuna). Peel the onion and cut it into ¼-inch dice or thin slices. Add the onion to the mixing bowl. Mince the dill (or other herb of your choice) and add it to the bowl. Toss all the ingredients together in the mixing bowl (I generally use my hands for this). Drizzle on some olive oil—a bit less than you think you’ll need. Toss again, then taste a bean to judge whether you’ve added sufficient oil; add more if necessary. Drizzle some vinegar onto the salad—again, use a bit less than you think you’ll need. Toss and taste, then add more vinegar if necessary. Right before serving, prepare the garnish (if using). Wash and dry some cherry or grape tomatoes, then cut them into halves. You can sprinkle them on the salad as is, or add some seasoning. I often toss the tomatoes with a bit of olive oil and minced dill before adding them to the salad (you can add vinegar too, but I find oil alone sufficient). 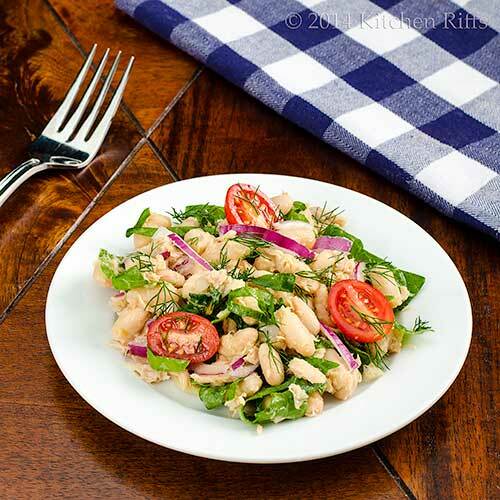 White beans (Great Northern, cannellini, or navy beans) all work well in this salad (although I prefer the first two). Garbanzo beans or black-eyed peas also are quite good. Kidney beans would work too, though I like them a bit less in this dish. The recipe specifies canned beans because they’re easy to use and take less time than cooking your own dried beans. Plus (for us at least) they’re a pantry staple. But you can cook dried beans for this salad, if you wish; they’ll taste a bit better. Oil-packed tuna has better flavor than water packed, so that’s what we recommend using in this dish. We generally add the oil from the can to the salad—no need to drain since you’ll be adding more olive oil anyway. Of course, the quality of canning oil isn’t as good as extra virgin olive oil, so you many want to drain it off and use extra EVOO instead. Not in the mood for tuna? Canned salmon makes a nice substitute in this salad. No Swiss chard on hand? No problem. You can substitute spinach, or any dark green of your choice. If you’re using one of the “tougher” greens (like kale), just make sure to mince it finely. We prefer to use red onion in this salad because it looks great and has nice flavor. But yellow onions work too. If you find the flavor of onion too overpowering in salads, you can omit it or use something like a Vidalia onion (which has much less “bite”). You can also dilute the flavor by soaking the onion in cold water for 30 minutes before using it (drain and dry thoroughly before adding to the salad). Don’t have fresh dill? You can use basil instead. Or almost any fresh green herb. It’s easy to add/subtract ingredients in this salad to suit your preferences. Diced red bell peppers make a nice addition. So do drained canned pimentos. Pitted olives are another option. Or add a bit of thinly sliced celery or cucumber. “The Swiss chard really adds some flavor to this dish,” said Mrs. Kitchen Riffs. “Yeah, our veggie garden has been producing great stuff this year,” I said. “I see we have loads of green tomatoes coming along,” said Mrs K R.
“Let’s just hope we get to them before the squirrels do,” I said, harrumphing. “Well, I’m gonna beat those squirrels this time!” I said, slapping the table. “Hey, they’re only squirrels,” said Mrs K R in a soothing tone. “Uh, right,” said Mrs K R.
“Yeah . . . .,” said Mrs K R, clearing her throat. Hi Ray, even with the AC it can be a chore to use the stove at times. So this dish is perfect! ;-) Thanks for the comment. Hi Bam, I always love all the dill we get from our garden! Great minds indeed -- can't have too many bean salads, can we? ;-) Thanks for the comment. Oh, this is a great recipe and perfect for dinner on the deck. It is a full-meal, summertime deal. :) My herb garden is getting overgrown with dill.....Thanks for sharing this recipe, John! It looks hearty,healthy, and delicious. I make something similar to this salad and it is delicious. Love your swiss chard. Sorry for your squirrel issue. They can be very pesky. My father-in-law always had a smile on his face when he had a ripe tomato by July 4th. I wish I had paid closer attention when he tried to tell me how. Hi Pat, this is perfect for deck dining! Simple and tasty -- what could be better? Thanks for the comment. Hi Pam, it's really such a tasty, simple dish -- we love it! Thanks for the comment. Hi Madonna, white beans and tuna is such a classic -- and so easy to add things like Swiss chard to make a new dish out of it. We should be getting tomatoes soon -- assuming the squirrels don't outwit us (always a possibility, although I think I have them thwarted -- we'll see). Thanks for the comment. Beautiful salad, John! I'm with you on no-cook meals and this one looks delicious. I tried growing tomatoes last year and the squirrels demolished them. PVC cage sounds like a brilliant idea. They are pretty persistent, though. I gave up this year. Great salad and great post! I just happen to have received some terrific tuna...this recipe was meant to be John...thanks. The cat always gets the tuna water. :) A perfect salad for the summer heat. We've been eating a salad every night and some nights, just a salad. This salad has everything one needs for a meal including lots of flavors. Thanks for the idea John! Know what you mean about varmints and gardens. We don't have squirrels, but the racoons dug up and broke a couple of my pepper plants the other night. UGH!!!! Oh NO! I had no idea the squirrels would attack my tomatoes. This is the first year I'm growing them here in PA and there are many, many squirrels reaking havoc on the bird feeders. If they touch even one of those tomatoes sitting so pretty waiting to turn green, Mrs. K.R. will have to keep both of us out of the nuclear hardware store!!! Thanks for the heads up, John. I best prepare before it's to late! This is a great idea - any excuse to get in more greens and I am on board! Hi John, love this salad, we can get fresh tuna up here in Oregon sometimes right off the dock for 3 and 4 dollars a pound, will pin this for the occasion. You and your wife sound like my husband and I about the rodents. We have actually turned ourselves into the old cartoon characters, with the varmints always one step ahead of us. All of my favorite summer ingredients in here. I love suppers or lunches like this. So refreshing, light and delicious. 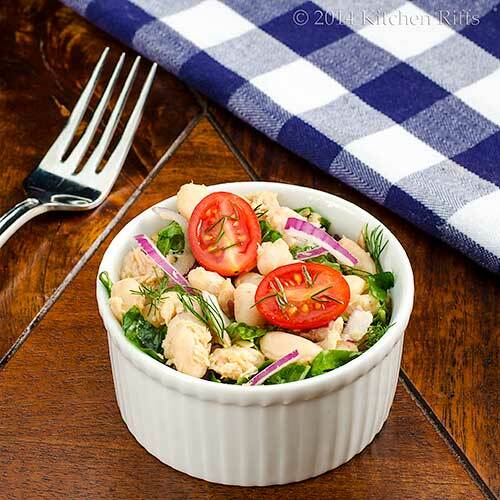 Salads are one of my favorite things about summer - and I so love your combination of beans and tuna and chard - and the red onion in it is a colorful and flavorful touch! It's the first year we're growing tomatoes too but I am pretty sure we have no squirrels to speak of in the area. Even though there is a park across our house... The birds however, are another story! But we'll see... :) This salad looks like he perfect summer salad to me! Hi Bill, squirrels definitely are persistent -- we'll see if the cages work. ;-) Thanks for the comment. what a simple and delicious looking salad. definitely a recipe i will be making... thanks! Hi Barb, last year the squirrels got at least 80% of our tomato crop. This year they're batting zero, but the season is young. We'll see. ;-) Thanks for the comment. Hi MJ, racoons are even tougher to combat because they're well, tougher. ;-) Salads at this time of the year are so good, aren't they? Thanks for the comment. Hi Louise, your bird feeder might be enough to keep them occupied. Let's hope! That ornamental fennel might be pretty good on this! Certainly sounds wonderful. Thanks for the comment. Hi Alyssa, this is one of those dishes that even people who don't like greens will like! A whole lotta flavors going on in this dish. Thanks for the comment. Hi Cheri, I'm pretty sure the squirrels will figure out a way to get a step ahead of us! Fresh tuna would be awesome in this dish -- lucky you! Thanks for the comment. Hi Karen, isn't this such a nice meal? Our kind of food at this time of the year. Thanks for the comment. Hi Natalie, this would make a wonderful lunch. Or dinner. ;-) Thanks for the comment. Hi Shashi, red onions are one of my secret ingredients! Good, but mellow, flavor, and they look so great. ;-) Thanks for the comment. Hi Nee, I'm fully expecting the squirrels to show me who's boss by the end of the summer. ;-) I'll keep you posted! And a bit of heat would go nicely in this. Thanks for the comment. Hi Simone, we've got squirrels, rabbits, foxes, hawks, the odd coyote -- and we're in an almost-urban suburb! Lots of trees and bushes, though, so there's a lot of habitat for them. Thanks for the comment. Hi Thalia, isn't this nice? Loads and loads of flavor, yet so easy to make! Thanks for the comment. Hi Rocquie, summer and salads just go together, don't they? I love this sort of food! Thanks for the comment. This sounds like a perfect hot summer evening dinner. A yummy baguette and I'd be all set! Oh, don't forget the butter, please. Hi Chris, definitely need butter for the baguette! That is the perfect dinner. Well, maybe a glass of wine, too. ;-) Thanks for the comment. hahahahaa!! Nuclear stockpile indeed. Squirrels can be so annoying...but cute at the same time. wonderful salad. Perfect for a hot summer day by the pool. Love it. And oh so good for you too! I need to make more salads at home this summer; I've been doing so much sushi from whole foods, it gets really pricey. I have been absolutely ADDICTED to tuna lately - every day for lunch (except today!) for the past couple of months, I just cannot stop.... But paired with white beans, OHHHH that sounds even more divine! It should be obvious that I am trying this soon with our abundance of chard! Great recipe, John. Truly cant't wait to try this for a light supper! Hi Minnie, squirrels really are cute, and I wouldn't really do the nuclear option with them. At least I don't think I would. ;-) Thanks for the comment. Hi Amira, it must be difficult when Ramadan falls in the summer -- not only are the days longer (so eating time is reduced), but the heat and lack of water has to be extremely uncomfortable. Anyway, when sun goes down, you can look forward to this! Thanks for the comment. Hi Dawn, Whole Foods sushi is good, but really pricey, as you say. This is much cheaper, particularly if you have your own garden. Thanks for the comment. Hi GiGI, tuna and white beans are such a terrific combo! And a classic Italian dish. This recipe kinda kicks it up a few notches. ;-) Thanks for the comment. Hi Dottie, fresh dill really has such a lovely flavor and fragrance, doesn't it? I love it! And it's perfect in this dish. Thanks for the comment. Hi Debra, I'm impressed by your Swiss chard recipes! And it's having such an abundance of the stuff in our garden that inspired this one. Thanks for the comment. This sounds like a great salad for the summer months. I would probably eat as a one dish meal. I love all the ingredients in this, so no reason to have anything else with. Thanks, for sharing. Hehe, I love that exchange between you and Mrs KR. Such energy going on! I hope that's what your conversations really do sound like, because that's pretty amazing. As is this salad--talk about a perfect picnic food! Hi Dawn, it's a great one-dish meal! We do variations of this salad all summer long. ;-) Thanks for the comment. Hi Ala, a lot of our conversations really do sound a lot like that! We always have a good time. ;-) Thanks for the comment. Hi Charlie, they do indeed eat tomatoes, much to our annoyance. And I agree that dill and white beans are a wonderful pairing. Thanks for the comment. This is a summer must have... It is so fresh, light, and loaded in protein!!!!! Love it! On a day when it's almost snowing outside, I welcome your summery salad, John, it really is lovely! This is one complete, nutrition-packed meal! I prefer red onions in this as its flavour will complement the tuna. Love it! What a gorgeous salad to feature it! This will come to my table over the weekend. A nice riff on a Nicoise salad! Our tomatoes (and basil) are also in jail! A tasty and wholesome salad! Perfect for taking on picnic or to a party. Hi Denise, we do love salads in the summer, I must admit. ;-) Thanks for the comment. Hi Bizzy, if I had your weather, I'd turn this into soup! ;-) Thanks for the comment. Hi Julie, red onions really have such nice flavor, don't they? And I love their color! Thanks for the comment. Hi Uru, we love to grow Swiss chard in our garden -- it's almost fool proof. Which we need. ;-) Thanks for the comment. Hi Claudia, gotta put your best veggies in jail, don't you? ;-) Thanks for the comment. Hi Rosa,a this really is a great weekday salad -- quick to make, and pretty healthy. Thanks for the comment. This salad looks great! In this heat, I need all the no-stove-needed recipes I can get. And, I was sure all the worst squirrels were in my yard! Glad to hear I'm not alone. This salad is exactly what I want for lunch every day this summer! At our house, it's the raccoons that run off with the produce! Your salad looks terrific...perfect lunch fare! Hi Mary Frances, it's nice to take a break from the stove sometimes in the summer, isn't it? Thanks for the comment. Hi Lisa, those squirrels can be pesky, can't they? I think I've got them licked, but I'm pretty sure they've got some surprises for me. They're devious! ;-) Thanks for the comment. Hi Liz, we're lucky in that the racoons seem to be leaving us alone. Probably that'll all change tonight! Thanks for the comment. This is a delightful summer dinner! I make things like this with leftover salmon all the time. I've made a white bean and tuna salad on several occasions very similar to the one you postd a while...it makes regular lunch time appearance, often stuffed in a tomato. But I LOVE the idea of adding chard or kale! Especially now that those leafy greens are coming at us full force in our garden and CSA box! Hi Laura, don't you love salads like this? Leftover salmon would be awesome in this! Thanks for the comment. Hi Samantha, I've served something similar stuffed in a tomato too -- very nice presentation. Plus it's tasty! ;-) The chard is really nice in this, IMO. Thanks for the comment. Squirrels that eat your tomatoes??? I didn't know they did that. I guess having a couple of fuzzy dogs in the back yard is serving a purpose that I had NO idea about. I will have to up my respect level for their guard dogging. I just was thinking about chard yesterday. Asking myself why I had not planted any. Good thing there are several Farmer Markets in the area. This is a hearty salad, but refreshing for summer. You presented it very nicely too. Hi Maureen, isn't this nice? We're eating salads like this by the gallon! ;-) Thanks for the comment. Hi Carol, squirrels really can be something! I'll bet your fuzzy dogs are indeed policing the squirrels for you. ;-) Thanks for the comment. Hi Kumar, this really is a nice salad, and so easy to change things around if you like. I sometimes omit the tuna and substitute something like quinoa. Thanks for the comment. Looking forward to the next instalment of Man vs. Squirrel. I hope man wins! And I like white beans so much that I'm not sure why I've never used them in a salad. This would be a good place to start. Hi Beth, I hope man wins too! ;-) And thus far it's Man 1, Squirrel 0 but it's a long summer. White beans work extremely well in a salad -- they're made to marry with olive oil, IMO. Thanks for the comment. I love this dish. It reminds me of when I travelled to Italy. I ate this dish almost daily only with spinach or Romaine. Great dish! Hi Greg, we definitely need a pool party today -- it's hot enough! Thanks for the comment. Hi VIcki, isn't this such a great classic combo? Great flavor, and quite healthy -- what's not to like? ;-) Thanks for the comment. Hi Sue, vino is pretty much a given, yes? ;-) Thanks for the comment. I love this protein packed refreshing salad! I always keep a can or two of tuna in oil! It's very convenient when I need a quick salad, etc. The swiss chard and tomatoes give nice refreshing color to the salad. Very nice~~~! Hi Nami, I love color in food! And this really is such an easy, healthy dish -- and with loads of flavor. Definitely a winner in my book. ;-) Thanks for the comment. Love this colorful and protein packed salad. It's a winner in my book for being healthy and easy to make also. 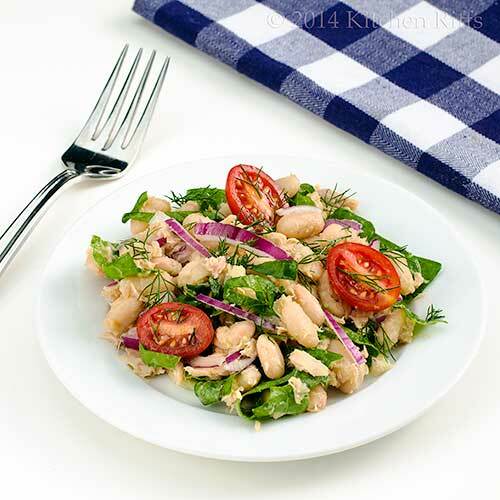 I love white bean salads -- so substantial and good for you. Plus, they make an ideal picnic dish. Hi Lail, isn't this nice? Easy and tasty is always a winner in my book! Thanks for the comment. Hi Carolyn, I don't think it's possible to have too may recipes for white bean salads! I really love them. Thanks for the comment. I love everything about this salad. Great combo. And darn those critters! I'm telling you, squirrels are persistent little devils. Love the conversation piece of your posts. Hi Lea Ann, isn't this such a nice salad for summer? Or any time, really. ;-) Those squirrels really are persistent. Hope we have the problem licked, but we'll see. Thanks for the comment. This is such a great salad. I also like making salads in summer when the heat gets to me! Hi Ashley, pretty hard to top salads when it comes to beating the summer heat! Thanks for the comment. Hi Dedy, gosh, thanks for that very kind comment! I love absolutely everything about this salad. Fresh, light and easy to prepare, couldn't wish for more this summer. Hi Raymund, isn't this nice? I love easy (and flavorful!) dishes like this. Thanks for the comment. Hi Hungry Mum, white beans have so much flavor, don't they? We eat them in everything! Thanks for the comment. Hi Daniela, this really is such a nice summer dish. Perfect with the hot weather we've having this month! Thanks for the comment. Hi Purabi, I love using Swiss chard in different ways! It's a winner in this dish. ;-) Thanks for your comment. I have a can of tuna, swiss chard, and tomatoes in the fridge. All I need is some beans. This is my kind of lunch. Packed with flavor and nutrition! Thanks for sharing! Hi Holly, this is so worth trying -- loads of flavor and full of nutrition. And easy to make. ;-) Thanks for the comment. This is definitely a great summer party dish! Thanks! Hi Kristi, isn't this nice? So refreshing! Thanks for the comment. This dish reminds me so much of Summer Lunches in Spain. Love it! Hi Vicky and Ruth, summer lunches in Spain must be wonderful! Thanks for the comment. Boy, with all those defence weapons you have in your garden, might be better to just go and buy your veggies at the supermarket (but then that might take some of the fun out of cooking)! This sounds great, fresh and vibrant and perfect for summer. Hi Fran, it'd be cheaper to buy veggies than grow them! But the tomatoes don't taste nearly as good. ;-) Thanks for the comment. Hi Caroline, isn't this nice? Such lovely flavor and color! Thanks for the comment. This is exactly what we do - our pantry always stocked with white beans and tuna, our fridge always holding greens - all summer long. Just a great, tasty, healthy and quick meal. Hi Jamie, isn't it great to have the makings for a quick meal in the pantry? We love this sort of dish! Thanks for the comment. tuna and beans are one of my favourite combos! Hi Amy, don't these pair together so well? I love this dish! Thanks for the comment. A delicious salad indeed and nutritious too. Its been really long since i used tuna and I got to grab a can soon. Hi Taruna, isn't this nice? 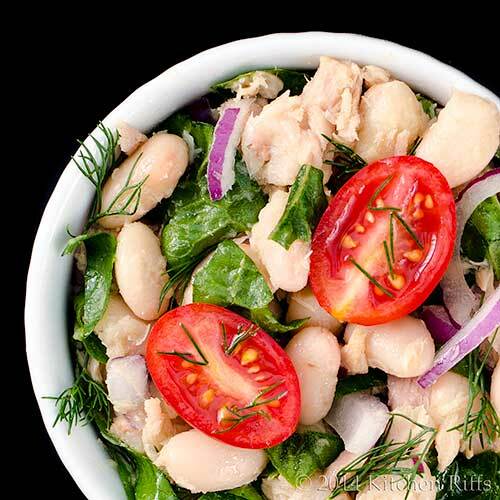 Tuna and beans are such an awesome combo in salads! Thanks for the comment. I am definitely making this salad on Saturday. One of my birthday dishes. Hi Norma, is it your birthday on Saturday! Happy Birthday! And this will be a great way to celebrate. ;-) Thanks for the comment.